“Daughters”- Perfectly described as a reflection of God’s love! It is not the flesh and blood, but the hearts and feelings that form the dynamics of parents and daughters relationship. Daughters fill colors, joy, rejoice and warmth in the lives around them. Falling on the 4th Sunday of September, Daughter’s day celebrates their spirit of love and acknowledges their special place in this world. Are you looking forward to make this day special for your little angel? Here is a list that will help in bringing a lovely and cheerful smile on her face. Cameos are beautifully carved designs and portraits of people in the finest quality stones. Cameo pendants are disguised as good luck charm and thus will act as a protective shield around your daughter. Each pendant denotes an era. So if she is fond of stories about faraway places, this is where her adventures and anxieties would land. Macramé is the most sizzling jewelry trend this season. These subtle, leather style cord bracelets imparts a classy look to its wearer. If she follows the unconventional but funky trend, this piece can’t be turned down. Because ‘unique-and-pretty’ is the order of the day, nail rings embellished with sapphires, diamonds and tsavorites grab 3rd seat on the list. With contrasting colors and glitters, nail ring will lend a different accent to your daughter’s gorgeous hands. If she has time crunch and can’t commit to manicure, nail rings are a great stand alone. Somewhere between stud earrings and swaying chandelier earrings, drop earrings are the stylish artwork for fashionistas. Due to their fixed position, these pretty baubles are more comfy to adorn. Although daughters do not forget, but these drop earrings will remind her of your infinite love and care. Hair is the best accessory of a girl. Add a different look to her vivacious hair with a diamond studded hair comb that looks classy and fabulous. Hair combs look elegant even with a simple outfit. Gift this on her special day and see the sparkle in her eyes. Jewels have the power to convey those unspoken words. So this daughter’s day, gift her unique accessories to let her understand how precious she is!! The most adorable thing about the spring and summer is that you can explore many styles flaunting your arm. This is the season when short sleeves are very common, and you can flaunt your arm with the beauty of arm candy bracelets. Arm candy bracelets are not only fun to wear, but also it is a great fun in creating one for yourself. You can stack bracelets in different style as stack all the skull bracelets or all the bead bracelets. You can also stack the love bracelets together to give a teen look, or you can pile up all the spike bracelets to reflect the toughness of your nature. You can also go to mix and matching different color and different style of these bracelets. They are just gorgeous to see that how they complement each other. If you have a problem in selecting the bracelets for stacking, I will like to suggest you to stack with some gold bracelets with different hues of diamond and gemstones. You can also experiment with different designs as macrame, beaded, pave diamond or some others. They can never go wrong with any outfit. I have a strong feeling for this fun full arm candy bracelet is that a regular and simple outfit can be changed into a sparkling eye catching look with just a simple addition of some interesting arm candy bracelets. This could be yours statement jewelry if you flaunt it regularly as your style statement. It has an entire element to convert your personality into a rock star type appearance. They can not only light up your wrist, but I bet they can also transform your life with the naughtiness of the colored bracelets. So what do you think? Are you going to create your own arm candy? My suggestion for this summer is to wear a pair of ice blue jeans, a white shirt, a pair of flat ballet shoe and some innovative arm candy. Start stacking the bracelets to make your own set of wonderful arm candy to explore this summer. The pattern is termed as Macramé. Thick knots are made rather than weaving or threading, hence this pattern looks artistic and novel. Threads of linen, cotton twine, hemp, leather and yarn are used to make different types of materials out from it for example these are used as wall hangings, decorative, ornaments, friendships bands and jewelry items. Gemco Designs have been creating a huge brigade of Macramé jewelry, for example ornaments like bracelets, rings, necklaces and feet jewelry are crafted here. 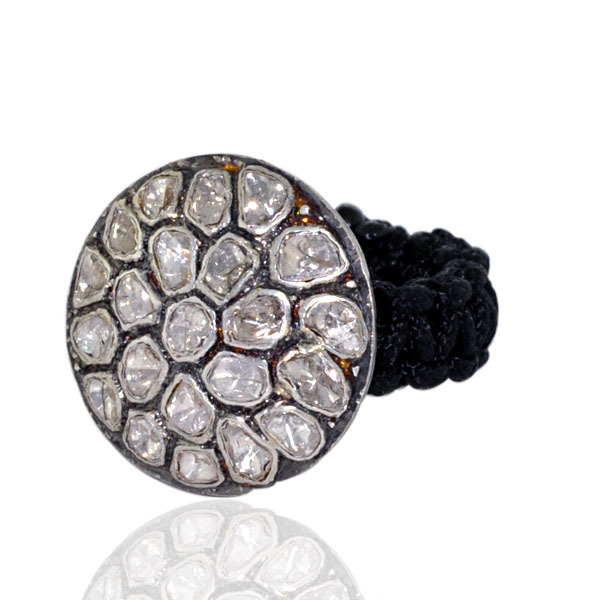 Diamond, gold and silver studded charms are immaculately placed in the macramé bands and fitted with precision. Spacers, connectors, pave balls are ornamented with melee diamonds or gold are heavenly polished and adjusted into the knot band. Necklaces and rings are some more of added assortments which we have experimented and witnessed some huge following and liking towards the accessory. Feet ornaments consist of macrame knot anklet which is studded with melee diamonds to accentuate your feet. Hence we cater to all kinds of jewelry and accessory, you think of it and we have it. This kind of jewelry is all about showing your taste towards jewelry get into the transition vogue line and walk with confidante.